One of the methods of upgrading VMware ESXi 6.0 to 6.5 is via ISO (or CD-Rom). Most of you probably don’t use much CD-ROMs and CDs, but servers, especially in small client’s environments usually don’t have KVM, iPMI, ILO, Drac… so one of the options is still to upgrade via CD-ROM. I also recorded a short video from the process, which is really simple. You don’t need to go to the CLI and you only need a clean ESXi 6.5 ISO image. It is one of the supported ways to upgrade VMware ESXi 6.x. To upgrade via ISO or CD-ROM You don’t have to remember any CLI commands, and you don’t need to setup anything except just to burn a single CD-ROM. 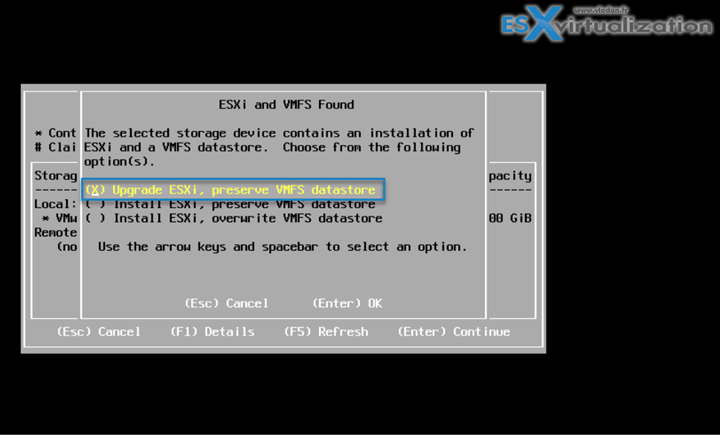 Your VMFS local data stores and all other configurations are preserved when you upgrade. You could also use an iPMI and attach the ISO via the remote access (will do that post too), but as being said, not all servers has this options for free (for example Supermicro does, Fujitsu does not…). Update: This post meant to be an information about standalone (non-managed) ESXi systems. If you’re running vCenter server in your environment, you have to upgrade your vCenter to 6.5 first. Obvious for some, but not for others… You can check my new lab post where I’m upgrading/migrating my vCenter 6.0U2 (Windows) to VCSA 6.5. Update2: And if you ask me what’s first to check? Device drivers like Network cards, storage adapters etc etc…. There is a follow-up post on how I updated a Firmware and driver on my X710-DA2 10GbE NICs … Check the post here. And also a post where you’ll learn How to create a custom ESXi 6.5 ISO with VMware Image Builder GUI. Option to prepare a USB stick and upgrade by booting from USB is also interesting – check this How to create a USB media with ESXi 6.5 Installation. We will explore other ways to upgrade (via CLI, via Network, via USB) in one of our future posts too, but today we’ll stick to something really simple. 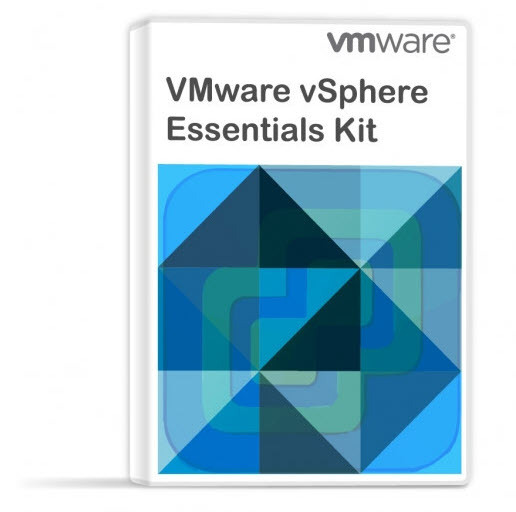 Note that VMware has made the download available and released ESXi 6.5 just yesterday. I also recorded a short video from the process, which is really simple. You don’t need to go to the CLI and you only need a clean ESXi 6.5 ISO image. Step 2: Boot your host from the ISO image (Change the Boot order in your BIOS, if necessary, so you can boot from CD-ROM). Step 3: Follow the instructions on the screen. Keep the defaults when at the upgrade screen. After the upgrade completes, just reboot the host. You’ll find everything in place. Your network settings, VMFS datastores, your root password…..
Hopefully, this short video will make things easier. Enjoy. Thanks Christoph for your comment. can one do this with 5.5 to 6.5?? or is a new clean install required?? Thank you, I was double-checking. They do change the disk configurations and things sometimes. I’ll double-double-check again next year with VMware before I actually do the upgrade. I cannot upgrade from ESXi 6.0 to 6.5 using the ISO. I can’t even get it to install clean. Granted, I’m trying this on non-server hardware (a MacBook Pro) but it installed and runs 6.0 just fine. I tried to do it using esxcli but when I run “esxcli software sources profile list -d https://hostupdate.vmware.com/software/VUM/PRODUCTION/main/vmw-depot-index.xml | grep -i ESXi-6″ it only lists 6.0.0 software, no 6.5.0. Any suggestions? Thanks anyway. Will keep an eye out on those other methods you mentioned you’ll be covering (CLI, network, USB), so maybe I could try it. I made the mistake of upgrading ESXI 6.0 to 6.5 without upgrading the VCSA first, now I am unable to login using web/client. Is there anything I can do to fix this without having to format/reinstall everything? Nevermind, I was able to login after a few minutes, that was strange. do I also have to upgrade VSAN 6.2 to 6.5 or will it done automatically? Among the list of 6.0.0 versions. Hi Vladan ! You probably know it, but with a little gadget like this Virtual ODD ISO (less than 50$), no need of CD for small client environments ^^ Just USB port and go ! Note: vCenter Server 6.5 does not have a compatible NSX version at this time. I have a questions, I run a Vcenter host 6.0 on it’s own hardware and add my esxi hosts to it. TO migrate to 6.5 I need to do the VCSA and run it as a VM? I cannot install the appliance on the box in place of my version of Windows? If so do I need to go to this windows appliance, install esxi on it then run the installer to put the appliance on that version of ESXi? How do I then manage this esxi? I am confused because I don’t want to put the appliance on any of the hosts that I want to manage with vcenter. Anyway let me know how I do this if I have a blade server that was set aside for vcenter and vcenter only…. Yes, VCSA is an appliance and can run as a VM only. But, running VCSA on host which is itself, managed by this VCSA is supported scenario. You can of course separate things, and use your blade to install ESXi 6.5 and then deploy VCSA 6.5 on it, and then only migrated your Windows based vCenter. Hi. Ive installed esxi 6.0 on an usb stick ( meaning the server will start from that stick) and upgrading it now seems a little bit more complex, that just running the iso. DOu you have any input on how to update the USB installet version too ? Anton. The ESXi booting up and running from USB? You can still update the installation via ISO (CD-ROM). The process is the same. Once You boot from the CD/IDO, it detects the underlying installation (whether it is on local disk, USB… does not matter). It provides you with an option to UPGRADE. Thank you for your great post Vladan. I managed to update two single host everything went fine. the last host I am trying to update it does not comes back with the depot, and no error out. I can ping 8.8.8.8 and http://www.google.com everything seems to works. Can the Esxi 6.5 run on a HP DL360G9? Have you followed the same steps/procedure. Since i want to upgrade my ESXi from 5.5 to 6.5. Thanks for your great work, I hope you can do some infrastructure work like configure Zoning on external SAN Switch and server profiling for HP virtual connect as you know most enterprises have this scenarios and on top of then vitalization comes to work . You got it all wrong. I’m Vladan. As concerning your topic suggestion, thank you. I’m open for guest posting if you want. Thank you for correcting me,I hope my topic’s suggestions will be added value to your great work on your site and every one will benefits from it. If they’re on VMware HCL, why not?